The first shot fired by the Patriots on the Concord North Bridge near Boston, Massachusetts, in 1775 has been described as the “shot heard ‘round the world” and the beginning of the American Revolution. This historic event also represents the birth of a fledgling Nation, one driven soundly by the quest for personal freedoms and democratic ideals. 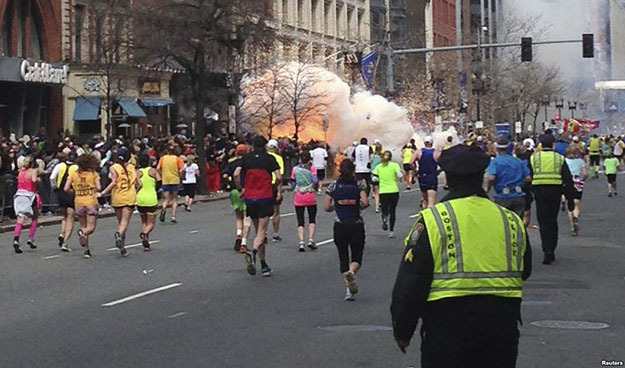 Another “shot heard ‘round the world” happened in the proud City of Boston on the day of the one of the country’s most famous athletic events, the Boston Marathon. This time, however, there was no Paul Revere around to alert the unsuspecting citizenry of an impending attack, nor did the attackers, whom we now refer to as “terrorists,” reveal themselves and their intentions. With no rules of engagement for waging what many call an act of war, the cowardly bombings that took place near the finish line of one of Boston’s finest traditions took and maimed the lives of many innocent victims. And in the context of what occurred not too far from Boston in 1775, this terrible act can be viewed as an assault on the very “personal freedoms and democratic ideals” that the Patriots of America’s colonial times so bravely fought to obtain. On this tragic day and its immediate aftermath, ripples of terror could be felt across the Nation and the world. But the City of Boston did not stand still, nor did it give up and surrender. True to its history, Bostonians, along with so many “friends of Boston,” rose to the occasion just like their revolutionary ancestors during the period of our country’s birth. Once again, the people of Boston demonstrated, individually and collectively, that they are a true beacon of hope and inspiration for the Nation and the world. Moreover, they showed that “Boston Strong” is much more than a simple tag line; on the contrary, it comes with deep meaning and is an undeniable force to be reckoned with! It is no wonder that one of Boston’s most historic neighborhoods is called “Beacon Hill.” Symbolically, especially at such an important time in Boston’s history, one could not choose a better name—one that conjures up fitting images of hope, inspiration, and innovation. And for a city that prides itself as being the “Athens of America” because of its vast intellectual and cultural roots and resources which, we should add, include its longstanding commitment to the Boston “Marathon,” another direct link to Greek antiquity, the image of Boston following the recent tragic events will not be tarnished. On the contrary, the defiant spirit of Bostonians, like the Spartans in ancient Greece, will not allow that to occur and, as a result, the image of their great, beloved City will only become stronger!